James Cruze (born Jens Vera Cruz Bosen, March 27, 1884 near Ogden, Utah – August 3, 1942 in Hollywood, California) was a silent film actor and film director. Cruze's middle name came from the battle of Vera Cruz. He was raised in The Church of Jesus Christ of Latter-day Saints, but did not practice the religion after his teenage years. Very little is certain about his childhood and teen years because he told a different story at every interview he granted. 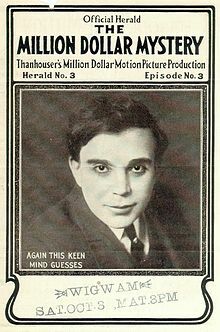 Cruze acted in, directed and or produced over 100 films mainly during the silent film era. His first known acting job was at Lubin Manufacturing Company in 1910. He started at Thanhouser Company in 1912 which is where the majority of his body of work was produced, much of it as the leading man. He married the actress Marguerite Snow in 1913 and had a daughter with her in 1914. They divorced in 1922. After leaving Thanhouser in 1916, he worked for several other companies as director and producer, primarily for Paramount Pictures, from 1918 to 1938. He married the actress Betty Compson in 1924 and they divorced in 1930. He married Alberta McCoy on 30 June 1941. McCoy survived him, and died in Hollywood on 7 July 1960. He is interred in the Abbey of the Psalms in the Hollywood Forever Cemetery in Hollywood, California. Wikimedia Commons has media related to James Cruze. This page was last edited on 3 July 2018, at 19:44 (UTC).